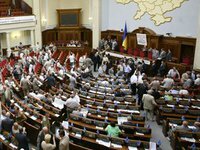 The Ukrainian parliament will consider the current situation in Ukraine on Tuesday, Verkhovna Rada Chairman Volodymyr Rybak has said. "At a session of the Verkhovna Rada tomorrow we will consider the current and future situation in the country," he said at a briefing in Kyiv on Monday. He also said that today he plans to invite the leaders of factions, including opposition factions, to continue the dialogue on how best to get out of the situation. "Today I am planning to invite the leaders of political parties... They should not only raise questions, but also to find ways to resolve these issues," Rybak said. He also noted that the question of the government's resignation would be considered on Tuesday, as demanded by the opposition. Rybak said that he would submit "the question [about a vote of no-confidence in the government] for consideration by the Verkhovna Rada – there are rules of procedure, and there is the law." He said that if the Verkhovna Rada decides tomorrow to consider the government's resignation without the decision of the concerned committee, "we will consider it without the committee's decision, in violation, because of the political situation." Rybak also noted that he would not advise anyone from the Party of Regions faction to support a vote of no-confidence in the Cabinet of Ministers.